WSU postdoctoral fellow Mark Caudell with Imani Kanuga, a Maasai leader in Nadonjukin Village, Tanzania. 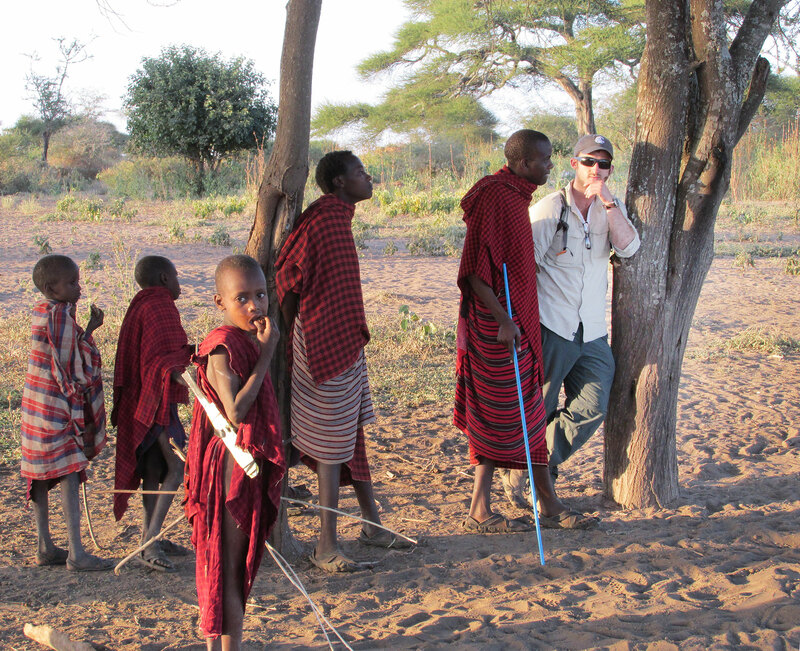 WSU postdoctoral fellow Mark Caudell discusses livestock movements with William Imani and Maasai herder boys. Doug Call, a professor in WSU’s Paul G. Allen School for Global Animal Health, Robert Quinlan, a professor in the Department of Anthropology, and Mark Caudell, a postdoctoral fellow, are the lead authors of a recent study in PLOS One investigating how human behavior, cultural context and living conditions in Tanzania affect the transmission of antimicrobial resistant bacteria from livestock to humans. “If our work points to specific interventions, then it may be possible to reduce the burden of antimicrobial resistance and to help African families have heathier and more productive lives,” Call said. Their work fits into WSU’s Grand Challenges, research initiatives aimed at particularly pressing societal concerns. In particular, the multidisciplinary team is helping address the challenge of sustaining health by tackling the onset and progression of disease and promoting healthy communities.